WASHINGTON (AP) — President Donald Trump signed an executive order Monday reimposing many sanctions on Iran, three months after pulling out of the Iran nuclear deal, saying the U.S. policy is to levy “maximum economic pressure” on the country. In a statement, Trump said the 2015 international accord to freeze Iran’s nuclear program in return for lifting sanctions was a “horrible, one-sided deal” and said it left the Iranian government flush with cash to use to fuel conflict in the Middle East. “We urge all nations to take such steps to make clear that the Iranian regime faces a choice: either change its threatening, destabilizing behavior and reintegrate with the global economy, or continue down a path of economic isolation,” Trump said. Trump warned that those who don’t wind down their economic ties to Iranian “risk severe consequences” under the reimposed sanctions. Secretary of State Mike Pompeo says renewed U.S. sanctions on Iran will be rigorously enforced and remain in place until the Iranian government radically changes course. 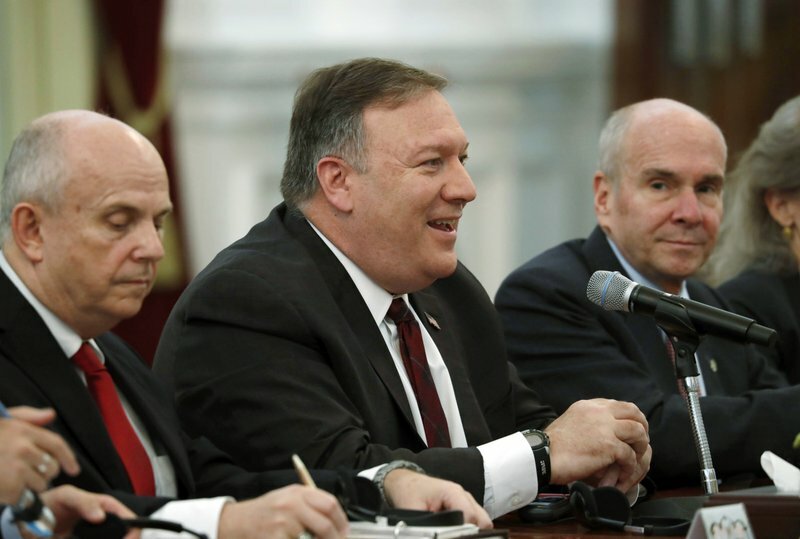 Speaking to reporters en route from a three-nation trip to Southeast Asia, Pompeo said Monday’s reimposition of some sanctions is an important pillar in U.S. policy toward Iran. He said the Trump administration is open to looking beyond sanctions but that would “require enormous change” from Tehran. European foreign ministers said Monday they “deeply regret” the reimposition of U.S. sanctions. A statement by European Union foreign policy chief Federica Mogherini and foreign ministers of France, Germany and the United Kingdom insisted that the 2015 Iran nuclear deal “is working and delivering on its goal” of limiting Iran’s nuclear program. A senior administration official said the United States is “not particularly concerned” by EU efforts to protect European firms from the reimposition of sanctions. The official was not authorized to discuss the matter by name and spoke Monday on condition of anonymity. The European Union issued a “blocking statute” Monday to protect European businesses from the impact of the sanctions. The official says the U.S. will use the sanctions aggressively and cited Iran’s severe economic downturn this year as evidence the sanctions would prove to be effective despite opposition from the EU, China and Russia. A first set of U.S. sanctions that had been eased by the Obama administration under the terms of the landmark 2015 Iran nuclear deal took effect on Monday, following Trump’s May decision to withdraw from the accord. Those sanctions target Iran’s automotive sector as well as gold and other metals. A second batch of U.S sanctions targeting Iran’s oil sector and central bank will be reimposed in early November. Pompeo noted that the U.S has long designated Iran as the world’s foremost state sponsor of terrorism and said it cannot expect to be treated as an equal in the international community until it halts such activities.